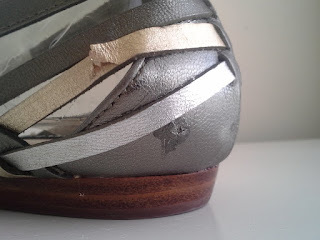 Shoemint Disappointment: Damaged Shoes Out of the Box! I suppose it had to happen eventually but I'm sad just the same. After months of Shoemint bliss, I've been issued a bitter pill. A few posts ago, I mentioned that I was waiting for a pair of Jills I'd ordered to arrive. They did arrive but were a bit snug so I figured I'd send them back in exchange for the cute metallic Marys. 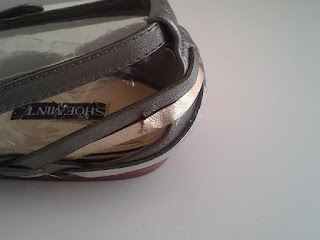 Shoemint's customer service by phone made this a breeze & were very accommodating. I sent back the Jills & yesterday my Marys arrived. I promptly opened the box to find, to my extreme dismay, a very much damaged shoe. After a good few minutes of very vocal & colorful complaining, I took the pics above & called customer service again. Again, customer service was helpful & accommodating (thanks Courtney!) & I'll be sending these back to get another pair. My main contention of annoyance remains however. How the hell are shoes this damaged making it out to a customer at all?! Admittedly, I do have plenty of flawless shoes & transactions with Shoemint but this really put me off. I can only hope that they up their quality control at Beachmint & this is a complete one off. In other Shoemint related items, I'm wondering how often they'll offer handbag selections. I was hoping it'd be monthly, like the shoes but that seems not to be the case. I am looking forward to autumn selections.